One True Fan is a new social media start-up that use social gaming technique to make users part of the single social graph. Social gaming is expected to be the next biggest thing as it integrates with social media. The game theory used in the website makes it stand out from other networks. The check-in’s you perform on every website you visit to achieve points. You can increase your points with more check-in’s. Social sharing and other activities done increases your social score. The current leader is named as “One True Fan”. An email is send to the person who lost the position when someone else grab his position to become the leader. The One True Fan website have lot of features which enable users to check out pages that are shared by other users. There is a player log option which helps the players to check what all activities they have done. The player log feature also let the players know how many points they earned, which level they have reached and what all awards they have one. The next feature is fanned site which helps to track which all websites have been fanned by each player. The website also have a feature to add friends. If you would like to automatically update the pages shared then you can download the browser addon and install that. This will be much useful as you won’t have to log in each time you want to become a fan of that page. You can now start browsing the web and see OneTrueFan in action. There is also an option to install One True Widget on other website. Copy and paste the script before the close of tag of your website and you are well to go. One True Fan allows to stay connected with your social circle. It shows allows you to see your social circle live on the websites that you visit. I hope that lot of publishers start to realize the benefits of the website. It is really interesting to know what type of website other people in your social circle are visiting. 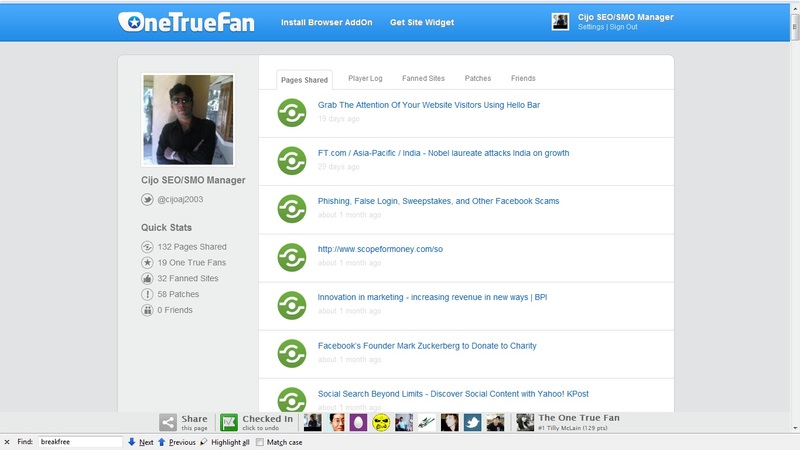 If you haven’t tried out One True Fan then you are missing what’s hot topic among your social circle.